Restaurant owners state that maintenance starts with the way your fry cook handles the machine. A messy fry cook will lead to more maintenance headaches. Grease splattered on the fryer can accumulate and attract dirt and grime that over time can be difficult to remove. Be sure your fry cook isn’t dragging the basket or splashing the grease when he drops the basket down. This can prevent future problems. Make sure you follow the manufacturer’s filtering schedule. If you fall behind on your filtering schedule, which is usually once a day, you’ll see oil performance decline, food quality suffer, and carbon build up in your tank. Some restaurant owners suggest cleaning the fryer at the start of the day. Wipe down the fryer with a dry cloth or rag. Used regularly, a dry cloth can extend the performance life of your fryer. One Fat Frog Restaurant Equipment can get you financed no matter what condition your credit is in for all of the used commercial restaurant equipment you need – including fryers! 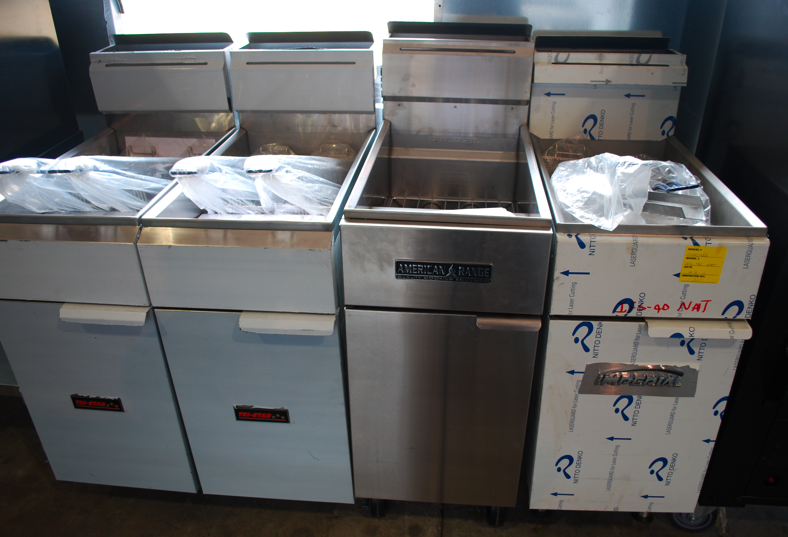 One Fat Frog Restaurant Equipment also offer quick cash and package deals on all of the used commercial restaurant equipment – including fryers!